Look who came by! It’s Gail Giraffe! She’s gonna help you with this alphabet tracing page. She’ll cheer you on as you write her name and lots of G’s. 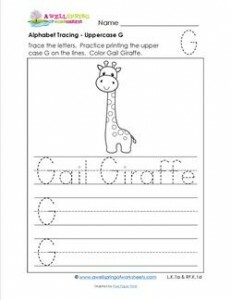 Go to this page to see all the alphabet tracing pages uppercase letters in this set.